mIBG – We are back on! As with all my posts, I try to include some thought provoking science, as well as interesting water cooler talk. Good luck. For those avid followers of all of the science that I have introduced during all of this, you will recognize that this post is a rehash, but an exciting rehash. When this scan was performed on Liam back in September, there had been problems and the scan was not performed right away. The doctors and hospital staff were having difficulty stabilizing Liam. In fact, that first session in the hospital lasted over 21 days. He had been started on a fantastic chemotherapy drug called Topotecan (which is a TopoIsomerase I inhibitor that is so darn cool, it deserves its own post and I will not discuss it here.) The problem was that Liam was spiraling out of control while he was on it. He started having trouble breathing, and he ended up with a plural effusion (yep… that was a bad couple of days. Click here for the post from that day). After all was said and done, the mIBG scan was pushed off until he was admitted for chemo round 2. When the  mIBG scan was finally performed, it came back negative. We were bummed, but the chemo seemed to be going so well that we really didn’t give it much thought. Liam was feeling better. After 6 rounds of chemotherapy, a follow up PET scan was performed. No cancer showed up on the scan. He had a remarkable response, and we thought we were doing pretty well. In reviewing all that had happened over the course of 6 rounds of chemo, I wondered if most of the cancer had vanished just after the first round of chemotherapy. If it did, it would have skewed the mIBG test to a negative result. Looking back at the sudden improvement after round 1- the plural effusion (now believed to be caused by cancer dying his lungs) and all of the immediate weight loss (now believed to be the cancer dying in his abdomen)…. he looked normal for the first time in months; I contend that the Topotecan chemotherapy made most of the cancer disappear quickly. His response even astonished his doctors. Now that the cancer has come back, it was suggested by the doctors at CookChildren’s that we look one more time at the mIBG. So, we did, and it gave a positive response to mIBG. It can clearly be seen in the left tibia and the pelvis. 123-mIBG Scan of Liam on 24July2015. His neuroblastoma has soaked up the mIBG compound, and due to its radioactivity is exposing the film. His trouble spots in his left leg and pelvis can clearly be seen. So what does this mean? It means that we now have a really awesome tool in our tool chest to fight this. It won’t cure the neuroblastoma, but hopefully we can knock it down and coupled with other therapies, we can get this disease under control for Liam. This is an option that a week ago we did not have. So, how does it work? It turns out that Neuroblastoma has a strong affinity for mIBG in about 85% of cases. In a very high percentage, the Neuroblastoma cells will take this compound up while the normal cells will not. This is called ‘selectivity’. (i.e. the Neuroblastoma soaks this compound up selectively over normal cells). mIBG in itself, however, doesn’t do anything. It is taken into the cell, and then is excreted from the cell at a later time. This means that the Neuroblastoma cells are not sensitive to the compound. A clever and ingenious pupil of chemistry can already see what to do next. 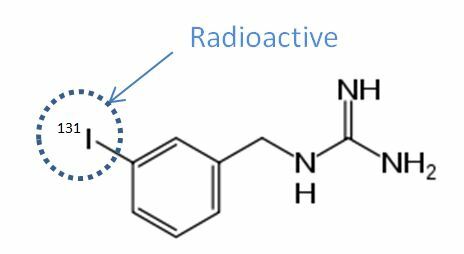 Swapping out the Iodine atom on this compound with the radioactive version makes this molecule very useful. 123 Iodine will decay by electron capture to form 123 Tellurium which will then emit a Gamma ray with an energy of 159 keV. This is useful for imaging. This is like having an x-ray performed, but rather than having an x-ray source shining high energy light through Liam, the light will be generated inside him! 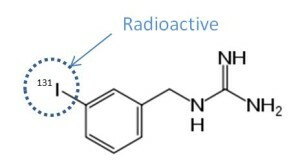 Since this radioactive atom is attached to a compound which is only selective to Neuroblastoma, Gamma rays (like x-rays) will be generated only at the Neuroblastoma sites. With the correct detector, the Neuroblastoma will light up like a Christmas tree. The Beta(-) decay produces a very energetic electron and an Antineutrino which have a tissue penetration of about 0.6 to 2 mm. This is enough energy to destroy cells. (i.e. a cell sized atomic bomb) So in essence, this gives a pathway for the mIBG, which is very selective to the Neuroblastoma, to blow up the cells (and leave the good cells alone). 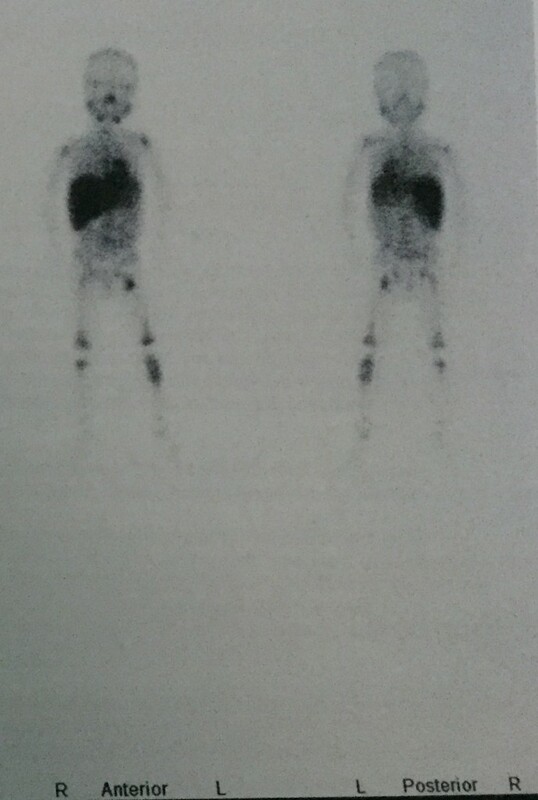 This mIBG scan that was performed today only involved 123 Iodine for gamma ray imaging (see above images). This indicates all of the places that the Neuroblastoma is, with a few exceptions. There are false readings in some of the places like the thyroid (which regulates Iodine containing compounds). In the coming weeks, it’ll be time to bring out the  Iodine and give this cancer the radioactive punch it deserves. Let’s not leave out the cool science. During the course of his treatment Liam will encounter mIBG (MetaIodoBenzylGuanidine). The first time that he encounters it, should all go well, is this week (~4Sept2014). He will be injected with the chemical so that his Neuroblastoma can be imaged. So, how does it work? It turns out that Neuroblastoma has a strong affinity for this compound in about 85% of cases. In a very high percentage, the Neuroblastoma cells will take this compound up while the normal cells will not. This is called ‘selectivity’. (i.e. the Neuroblastoma soaks this compound up selectively over normal cells). mIBG in itself, however, doesn’t do anything. It is taken into the cell, and then is excreted from the cell at a later time. This means that the Neuroblastoma cells are not sensitive to the compound. This mIBG therapy is typically only given in cases of Nueroblastoma that have relapsed, however, we may be one of the lucky families that gets this treatment as a clinical trial directed at making this part of the standard treatment. If everything works out well, we will be part of this trial sometime after 5 or 6 chemotherapy treatments. This mIBG scan being performed this week will only involve 123 Iodine for gamma ray imaging. This will indicate all of the places that the Nueroblastoma has metastasized to. It will be used as a baseline for how he is progressing in his treatment later on.